On Message: Who Wants To Cut Social Security? : It's All Politics The part of President Obama's fiscal 2014 budget plan getting the most attention is his proposal to change the way the government calculates inflation for Social Security beneficiaries. Economists call it chained CPI; some politicians call it fodder for the midterm elections. 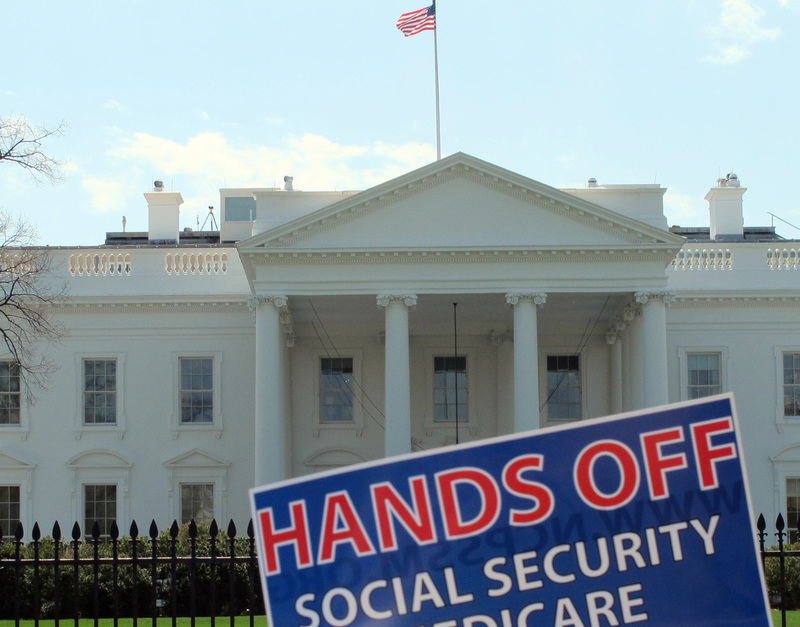 On Message: Who Wants To Cut Social Security? A sign outside the White House on Tuesday protests part of President Obama's proposed federal budget. The president's $3.77 trillion fiscal 2014 budget plan is expansive. But the part getting the most attention is his proposal to change the way the government calculates inflation using a measure known in economics-speak as chained CPI. Following Script: Much of the initial reaction was predictable. Liberal Democrats hate the idea, because it amounts to a gradual cut in Social Security benefits over time. President Obama made it very clear in his remarks that these were "ideas championed by Republican leaders in Congress." "I don't believe that all these ideas are optimal, but I am willing to accept them as a compromise," Obama added, after releasing his budget proposal on Wednesday. As expected, many Republicans praised the president's willingness to go there. In an interview with NPR's Morning Edition, House Budget Committee Chairman Paul Ryan, R-Wis., described it as "an olive branch." And the response was similarly positive from Rep. Peter King, R-N.Y. "He's putting a Democratic third-rail issue on the table," said King. "It could be the basis for the beginning of the process." House Speaker John Boehner, R-Ohio, even implied the president wasn't going far enough, describing chained CPI and the president's proposed trims to Medicare as "modest reforms." Out Of Left Field: So, it was a bit of a surprise when the chairman of the National Republican Congressional Committee — charged with getting Republicans elected to the House — blasted the president's plan as hurtful to the elderly. "His budget really lays out kind of a shocking attack on seniors," said Rep. Greg Walden, R-Ore. He went on to describe the president as "trying to balance this budget on the backs of seniors, and I just think it's not the right way to go." You'd be forgiven for feeling some political whiplash. The Club for Growth, known as an enforcer on the right, struck back. "Greg Walden doesn't seriously oppose even the most modest of reforms to Social Security, right?" said Club for Growth President Chris Chocola in a statement. "With nearly $100 trillion in unfunded liabilities, the last thing Republicans should attack the Democrats for is for making the most minor reforms to our entitlement programs. If anything, President Obama nibbles around the edges of entitlement reform and doesn't do anything to put entitlements on a permanently sustainable path." Chocola then suggested that Walden consider "clarifying his remarks" — soon. "Chairman Walden supports the budget passed by House Republicans that preserves and protects Medicare and Social Security while also balancing the budget in 10 years. He disagrees with President Obama's political plan that hurts current seniors just so he can pay for more wasteful spending." On Thursday, at his weekly press conference, Boehner stressed that Walden doesn't speak for him: "I've made it clear that I disagree with what Chairman Walden said. He and I have had a conversation about it. This is the least we must do to begin to solve the problems in Social Security." A spokesman for Rep. Eric Cantor, R-Va., said the House majority leader also spoke with Walden on Thursday, delivering a similar message. Looking Toward 2014: Interesting thing about the Paul Ryan budget, passed overwhelmingly by House Republicans earlier this year: It doesn't explicitly call for chained CPI or any other specific changes to Social Security. It simply requires the president and Congress to "submit a plan to shore up the Social Security Trust Fund." With his budget plan, Obama may have been responding to GOP requests, but he stuck his neck out by putting it in writing first. And as far as Rep. Alan Grayson, D-Fla., is concerned, that was a horrible mistake. "I think that not only will the president fail to benefit from this politically, but it could end up dragging down the entire party, depending upon exactly how this unfolds," said Grayson, on a conference call Wednesday put on by the Progressive Change Campaign Committee. His concern: that Democrats would lose the high ground on Social Security, and get attacked just as they were in 2010 on the Medicare changes in Obamacare. "Based upon the budget the Republicans submitted, the Ryan budget, it was pretty clear up to this point that the Republicans were the party in favor of cutting Social Security, cutting Medicare, cutting Medicaid, and the Democrats were the party against it. Now, with the president's proposal, we face the threat that we will be stigmatized as the party that kind-of is for it and kind-of is against it, kind of depending on circumstances. Kind of, kind of, kind of ... "
On Message is an occasional feature exploring the language of Washington. Tamara Keith is NPR's congressional correspondent.